Hello folks! Beth and the newsletter team here, welcoming you to the April edition of the newsletter. Hi everyone! Beth here, with your March newsletter. How on earth is February over already? Hello, Write the Docs people! Beth here, wishing you all a happy 2019. Is it too late in the year for that? Oh well, never mind. I’m doing it anyway. 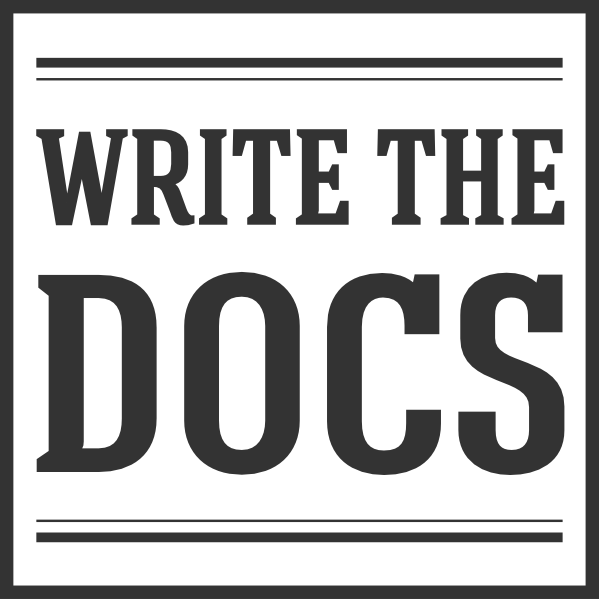 2018 was another wonderful year for Write the Docs, it marks our 6th year of existence. Hi, everyone, and welcome to the last newsletter of the year! Hi everyone! It’s Beth Aitman here, in my first issue as your newsletter editor. Hoping to continue Kelly O’Brien’s fine work bringing you news and interesting discussions from across the Write the Docs community. Hi everybody! Kelly O. here – back in the saddle after getting through the whole OMG, it’s a different year now transition. I’m excited to report that we have a TON of stuff happening in the community. I guess we’re starting this new year off strong! Happy November everybody! Kelly O. here, reporting live from the coffee shop that is about to cut me off because I’ve had three flat whites in a row. But I’m considering them celebratory beverages, because we have a jam-packed month of documentation goodness to talk about. Hello friends and fellow documentarians! Write the Docs Portland was another sold-out success! Many thanks to everyone who attended, presented, hiked, shared, discussed, and made it another great event. Videos of the presentations are now available! In the Northern Hemisphere, anyway. In the Southern Hemisphere, Fall has…fallen? Sounds good, let’s go with it! Hello, Write the Docs! As I’m writing this, there are gentle little fairy-snowflakes drifting past my window, and it’s triggering my instinct to hibernate something fierce. On that subject, this newsletter is going to take a brief hibernation period of its own over the holiday season. But never fear! We’ll be back in your inboxes once we’ve settled into 2017 a bit. Hello, Write the Docs! Let me tell ya, it’s been a jam-packed month for interesting conversations in the community. It’s been really exciting to see so much activity and engagement on the Slack channel. It’s even got us thinking about bumping the frequency of these dispatches up to twice a month, just so we can include more good stuff. Hello Write the Docs! If you’re getting this email, you’ve probably attended (or considered attending) one of the documentation conferences we’ve put on over the last few years. As our events have grown, so too has our community, and we’re working hard to make Write the Docs a year-round affair.